Back in 2011 there was some discussion of new latching-type relay/contactors that might be suitable for use as master relays. I remember at the time looking at the spec sheets & pricing of some of those devices and they seemed available & reasonably priced. I google search earlier this week failed to turn-up any devices that were reasonably priced and they seemed to have huge lead times. I want to consider using such a device but if they are difficult to get, I won’t bother. Does anyone have a source(s) for such a device? relay/contactors that might be suitable for use as master relays. of those devices and they seemed available & reasonably priced. were reasonably priced and they seemed to have huge lead times. get, I won't bother. Does anyone have a source(s) for such a device? All good points, many of which have been discussed on this forum. but, if they are difficult to obtain then I think the point is moot. are counting milliamps then your system probably has bigger problems. it's about a $135 device as I recall. of degree . . .
an SD-8 were very limited . . . not so much today. related to mission, hardware, full up vs.
endurance loads, battery sizes and PM protocols. of design goals and techniques used to meet them. picture is painted is huge . . . Attached is an untried circuit to reduce contactor current using PWM. The TC648 costs less than $2. It will start up at 100 percent duty cycle to pull in the master contactor. Then it will hold with PWM at reduced current. The progressive transfer type switch will normally be operated in the center position but can be full up to bypass the PWM circuit. system less reliable for very little benefit. I got one of these Tyco EV200 for use in my Sonex with an Aerovee Volkswagen conversion with a 20 amp alternator. I got mine on eBay for about $60 three years ago and they seem to be in that same ballpark today on ebay. I went from a measured contractor draw of 0.7A to 0.13A. The product is very robust and the amperage savings can almost operate my EFIS. but can be full up to bypass the PWM circuit. Good point, Jeff. My mistake. I added a diode. Keep in mind that I have never built this circuit. So there is no guarantee that it will work. The TC648 operating frequency of 30HZ can possibly be increased with a smaller value of C5. 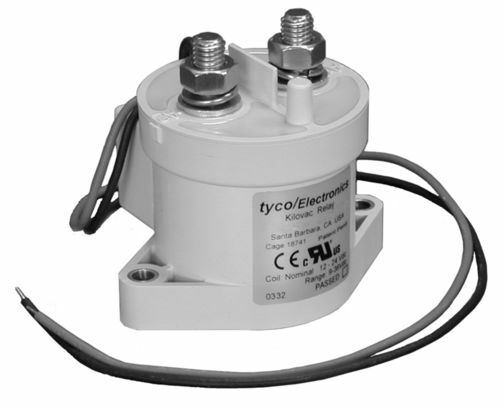 The TC648 is designed for use with fan motors which have inertia. The off time period is not a concern with fans but is a concern with contactors that could drop out. If my math is correct, the off time period at 25 percent duty cycle is 25ms. This might be too long and allow the contactor to drop out. The diode will delay the drop out. 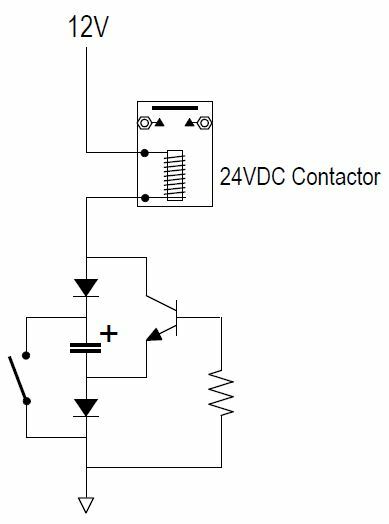 Will a capacitor in parallel with the contactor coil also help to delay the drop out? Has anyone considered this voltage doubling circuit ? It was the Circuit Cellar EQ question in Issue 248 March 2011. The theory behind the circuit is that while the contactor is off, the capacitor charges to 12V. When the switch is turned on, the positive of the capacitor is 0V, so the negative side becomes -12V. The transistor now conducts, applying 12+12=24V across the contactor coil, closing it. The capacitor quickly discharges and the transistor switches off, leaving 12V across the contactor coil. 12V is probably enough to keep the contactor closed and at half the current of a 12V contactor. Once the flight has begun, the failure mode is down to the contactor, the switch and one diode, which is the same component count as the standard circuit (The spike shunt diode is not required for this circuit, since the current from the coil serves to charge the capacitor faster). The article did not propose values for the components, so it is quite possible that the capacitor would need to be impractically large. I received this email today from Chuck (quoted below) in reference to my circuit "Contactor PWM.pdf " to reduce contactor holding current. I built the circuit with one change. I replaced R1 with an adjustable 0-25k ohm pot. Works great, just dial in the PWM for the right duty cycle with R1 for the particular contactor being used. to my circuit "Contactor PWM.pdf " to reduce contactor holding current. 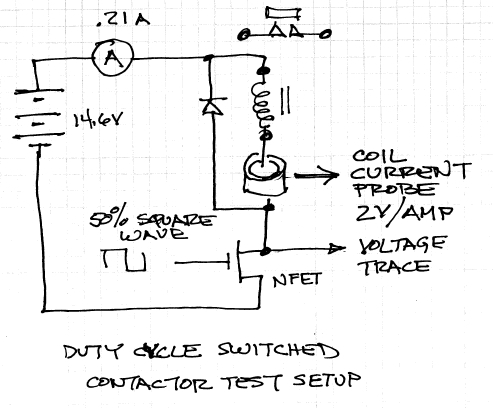 right duty cycle with R1 for the particular contactor being used. Is that 75% power reduction correct?? a 50% power reduction. Not sure about an inductive coil contactor though. applied the I squared power calculation to this. > my circuit "Contactor PWM.pdf " to reduce contactor holding current. > right duty cycle with R1 for the particular contactor being used. 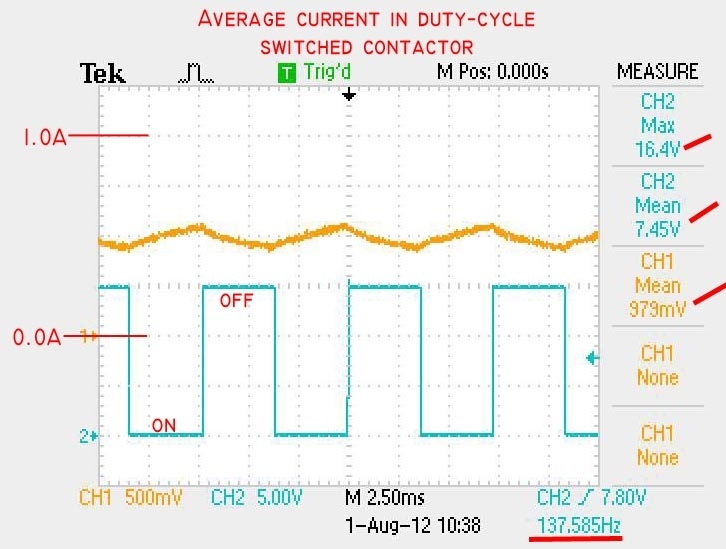 I would have guessed that a 50% duty cycle gave full voltage and full current for 50% of the time in a pulsed resistance circuit resulting in a 50% power reduction. Not sure about an inductive coil contactor though. Just asking but intuitively I would not have averaged the voltage and applied the I squared power calculation to this. is critical to the analysis. Stancore/RBM contactor draws 0.9 amps 14.6 volts. reduction in power in the resistive circuit. contactor was not too hot to sustained touch . . .
Waayyy cooler than contactor operatied at 100%. and applied the I squared power calculation to this. F shell at 50% duty cycle for a 40F rise. got a 180F shell temperature for a 100F rise. than 4x temperature rise for 4x the dissipated power . . .
applied voltage because the coil is cooler. a "contactor cooler" . . .
On power up, both capacitors are discharged. and energizing the contactor with full voltage. proximity to contactor is best.